Durban is situated on the sub-tropical East coast of South Africa, and is your gateway to the beautiful province of Kwazulu Natal, original birthplace of the proud Zulu nation. The East Coast is lapped by the warm waters of the Indian Ocean, and with its sub-tropical climate, Durban is a true year-round holiday destination. The coastline to the South and North of the city has kilometres of beautiful sandy beaches and attracts thousands of both South African and International visitors each year who come to sightsee, enjoy the beach, play golf or venture North to the many wonderful Big 5 game reserves that can be reached in less than a 3 hour drive. When deciding where to stay in Durban, the holiday accommodation in Durban, South Africa is plentiful and varied and you have a choice of excellent 5-star hotels in Durban and Umhlanga Rocks (just North of the City), as well as many cheap hotels in Durban’s city centre and literally hundreds of good B&B’s and guesthouses in Durban in the suburbs surrounding the city. Durban has an excellent International Conference Centre in the city and there are several central hotels in Durban, South Africa to stay at if you are coming on business or to a Conference. The best hotels in Durban central are the Hilton Durban, which adjoins the ICC and the Royal Hotel, a short distance away. There are also several Durban hotels along the near-by beachfront, which offer good central accommodation for business and holiday visitors alike. Some of the most popular are the Protea Hotel Edward and the Southern Sun Elangeni and Maharani Hotels. Over the last decade or so, Umhlanga Rocks has become home to many large corporate companies, and much of the business activity in Durban has shifted away from the city centre to this coastal suburb, about 30min north of the city. Umhlanga has always been popular with holiday makers, and there are a great number of options for accommodation here, ranging from some of the best Durban resort hotels, to excellent self-contained, serviced apartments to rent in Durban and dozens of top-class guesthouses or bed and breakfast in Durban. At the top end of the scale are the very luxurious Oyster Box Hotel and the Beverley Hills Hotel, both of which are right on the beach and truly special. 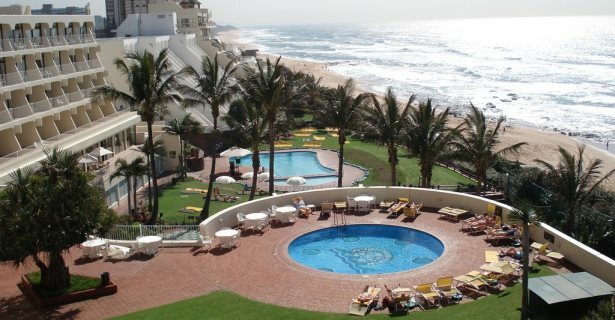 There are three very good Umhlanga Rocks resorts which offer self-catering accommodation in Durban in a resort environment, namely the Umhlanga Sands Resort, the Cabana Beach Resort and Breakers Resort. These are just a very small example of the many places to stay in Durban, and there are plenty of Durban Bed and Breakfasts and other holiday accommodation in Durban which offer cheap accommodation in Durban, South Africa and the surrounding suburbs.